Alkaseltzer “Termite” and “Clam” also won a couple of awards. This is one of my favorite spots simply because the whole thing is such a strange, grotesque, and ludicrous concept. I think that it if for these reasons that it is so funny and has managed to win several awards. This spot involved heavy live action compositing which was shot in one day, and turned out to be an accurate depiction of my animatic. This animatic proved to be indispensable as it worked out camera fielding, staging, composition, timing, etc, thus leaving the entire shooting day for just that – shooting, instead of wasting time working out any of these last minute issues. The live action shoot went smoothly, with the exception of the glass rig which involved sucking out the water from the glass quickly through a vacuum, as the clam drinks it. The props lady couldn’t hold the glass steady enough and we ended up having to rotoscope it out of each frame, stabilize it in Flame, and re-comp it. The set design worked out nicely, especially since I managed to find a checkered tablecloth which exaggerated the forced perspective, with the long vertical and horizontal red lines. 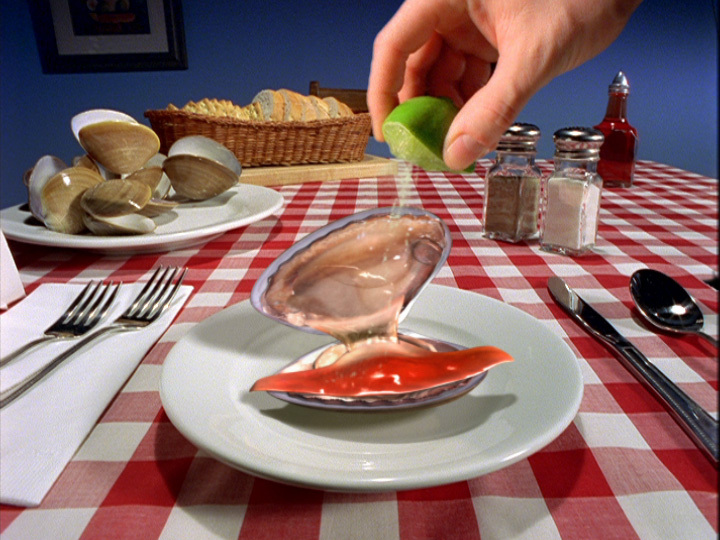 In addition, the set’s color palette makes the clam stand out and brings the viewer’s attention to it throughout the spot. 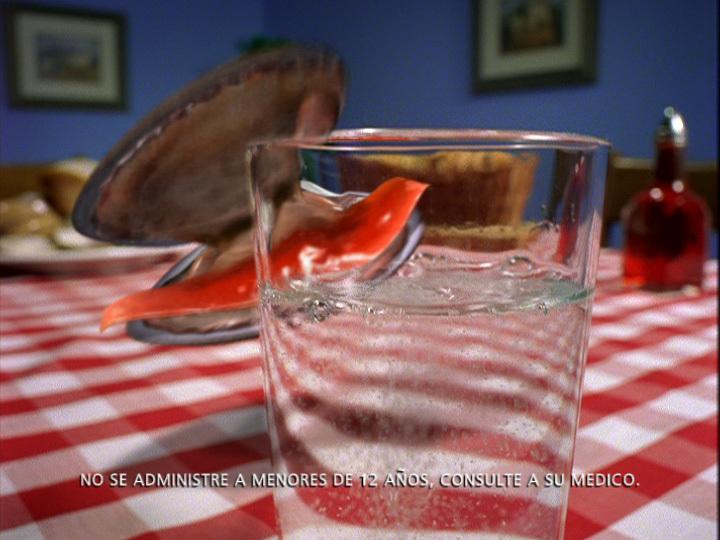 The clam model is based after a particular type of clam which is very common in Mexico. We shot many reference photographs while at the pre-production meeting down there for lighting, modeling and texture maps. Finally, we created two final versions of this spot: the client version and the director’s version. In the former, the clam releases a sigh of relief at the end and, in the latter, he boasts a loud “Barney Gumble” burp. This spot was modeled and animated with Softimage, rendered with Mental Ray, and composited with Discreet’s Flame.